Over and over our customers requested a BBQ pit that delivers a large cooking area in a compact footprint. The Stockton is the answer to this request. 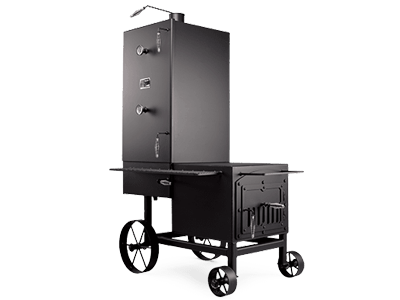 With just over 4,300 square inches of cooking surface in a compact space (62" long x 82" high x 36.5" wide), this pit can easily handle 24+ racks of ribs or 16+ pork butts or whatever your friends or customers desire. The Stockton is fitted with eight, two foot square racks positioned 4" apart. Load all eight or remove every other rack to increase cooking height. This design is as versatile as your cooking requirements are varied. Unique to the Stockton's design is the variable damper located between the firebox and the cooking chamber. The variable damper allows the pit-master to fine tune heat and smoke into the pit, creating temperature swings of over 100-degrees as desired. No matter how you use it, this pit is extremely versatile and will excel in the backyard, in competition or in commercial use.